Remember when life was more simple? 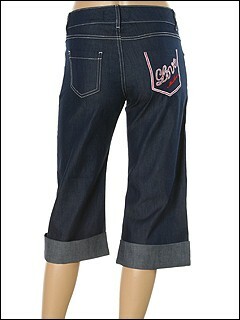 Take a leisurely stroll while looking absolutely lovely wearing these cute denim capri by LOVE Moschino™. Zipper fly with button closure. Five pocket style. LOVE Moschino embroidered on the right back pocket. Cuffed bottoms. 27 outseam. 18 inseam. 9 front rise. 13 back rise. 20 leg opening. 98% cotton and 2% elastane. Machine wash warm and line dry.